THE mere idea of Manchester as a port seemed fantastic in the year 1880, although the Manchester cotton merchants were awake to the advantages of such a scheme. If they could bring their raw materials from the other side of the world into the heart of the city without transhipping the goods, and send their manufactures out in the same way, they would be saved considerable expense. They realized, however, that to turn Manchester into a seaport would cost a vast sum. pondering over a ship canal ever since the plan had been brought to the notice of the Manchester Chamber of Commerce, was stirred to action by the proof of the benefit conferred on Glasgow. Convinced that Manchester would obtain similar benefits if she could be linked directly with the sea, Adamson invited the Mayor of Manchester and the officials of the surrounding towns, as well as members of the Chamber of Commerce, to discuss the matter on June 27, 1882, at his house, The Towers, in Didsbury, Lancs. That meeting, at which over seventy men discussed the subject with the engineers Hamilton Fulton and Leader Williams (later Sir Ernest Leader Williams) was the first step. A provisional committee was formed, with Adamson as chairman, and it was decided to make a survey to find out the cost of a canal from Manchester to the estuary of the River Mersey. Adamson, impressed by the success of the Suez Canal, was anxious to proceed without delay. He wished to adopt Fulton’s plan to build a canal without locks that would be subject to the rise and fall of the tide along its whole length. There was, however, one difficulty in the way of this tidal scheme. Manchester stands 78 feet above mean sea level and it would have entailed an enormous amount of excavation and colossal expense to cut the canal to this depth. If and when this tidal canal was built, there remained the problem of lifting the goods 78 feet from the water level to the city level. That expense would have been continuous. In the opinion of the committee it was easier and cheaper to raise an entire ship with her cargo by passing her through a series of locks than to raise the cargo piecemeal by lifts or cranes. So the tidal canal was abandoned and replaced by the plan of Leader Williams for a canal with locks. Directly it was realized that Adamson and his friends were serious in their attempt to build a ship canal for Manchester, the Liverpool authorities became alarmed. The plan to build a canal on the Lancashire side of the Mersey, into which river it was proposed to lead the canal between containing walls, seemed to them a grave threat to Liverpool. It was their duty to keep the channels clear, and they were convinced that if the Mersey were interfered with higher up, the flow of water would be altered and would lead to a gradual silting up of the Port of Liverpool. The Mersey authorities and the promoters of the ship canal were both faced with a difficult problem. The low-water channel of the Mersey was changeable. During the previous half-century it had wandered all over the estuary from one side to the other. At the mouth of the river were shoals and sandbanks standing some 20 feet or more above the low-water mark. The rising tide, flowing swiftly over the fine sands of Liverpool Bay, carried with it enormous quantities of sand in suspension when it swept up the estuary, which at one point narrows down to a width of 2,800 feet. The bottom of the river at this point is sandstone, with the main channel 70 feet deep As the tide lost its velocity, so the sand in suspension settled down on the sandbanks which were completely submerged at high water. It seemed that the shoals would increase in size and gradually choke the channel, but this was not so. The authorities discovered that during the first two hours and forty minutes of the ebb tide there was little sand carried away back to sea. After the tide had been ebbing for four hours its velocity began to increase, and the water up the river was 10½-in higher than the water at a fixed point a mile lower down. In the next hour the difference increased to 17½-in, which meant that the waters were rolling down faster than ever to escape to the sea. An hour later there was the big difference in the levels a mile apart of 2 ft 2-in, which was further increased to 2 ft 5-in in the following hour. The greater the difference in the levels, the more rapidly the water flows, sweeping away all the sand it has previously deposited. The Mersey authorities were so sure that anything which interfered with the upper estuary would jeopardize the seaport of Liverpool that they persuaded an American expert, Captain Eads, to come to England and oppose the Bill in Parliament. As Captain Eads had done important work on the mouths of the Mississippi and could state from his own experience what had happened there, his evidence was regarded as of the first importance. The Bridgewater Navigation Company, which owned the Bridgewater Canal, also opposed the scheme. Their barge canal already served Manchester, and the cutting of the ship canal, so far as they could see, threatened them with ruin. The railway companies which carried goods from Liverpool to Manchester were also strong opponents. STANLOW OIL DOCKS are situated about a mile above Ellesmere Port and a few miles from the entrance to the Manchester Ship Canal, where it is separated from the River Mersey by an embankment. Tankers unload in the docks and the oil or spirit is pumped underneath the canal to the storage tanks on the opposite bank. These tanks can store more than 80,000,000 gallons. Despite this opposition, Adamson and his friends instructed the lawyers to draw up a Bill asking Parliament for powers to build and run the Manchester Ship Canal. To their surprise, the Bill was rejected on a technical point; so, richer in experience, the promoters tried again. The railway and canal companies and other opponents of the canal fought against the new Bill in the House of Lords and the Bill was rejected. The defeat was a blow to Adamson, for it meant the loss of thousands of pounds. Without delay he set himself to raise more funds to present another Bill. He called on the men of Lancashire to help him and urged the local authorities to devote a penny rate to the scheme. His enthusiasm was such that money was found to back a third Bill, this time in. the House of Lords. The Lords were now satisfied and passed the Bill in May 1884. Adamson regarded his difficulties as over. In July, however, the Committee of the House of Commons vetoed the Bill. Adamson refused to accept defeat. Once more he cast round for funds to back another Bill. 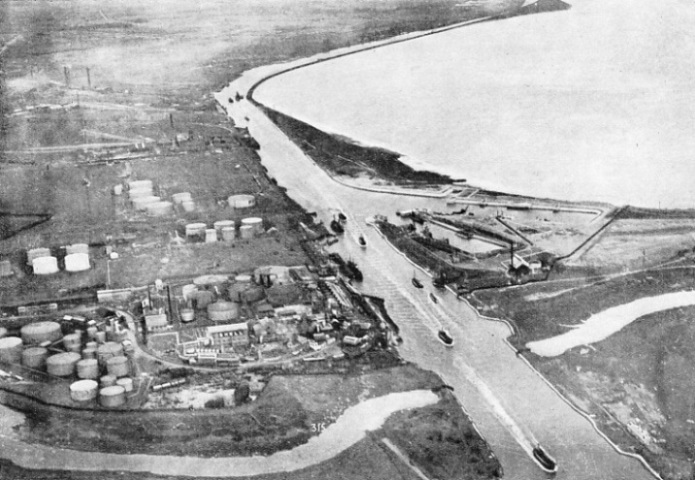 The canal scheme was modified, the course of the canal being changed to the other side of the Mersey to accord with the interests of the opposition. Adamson was diplomatic enough to make full use of some of the suggestions of Captain Eads and of the engineer of the Mersey authorities. Manchester Corporation decided to find the sum of £18,000 by imposing a rate of 2d. in the £, and the fourth Bill was presented in December 1884. This time it was passed by Commons and Lords, and on August 6, 1885, the promoters were empowered to build their canal. That bitter fight in Parliament is said to have cost the promoters and their opponents the sum of £350,000 in expenses. This huge sum was a mere trifle compared with the money that had to be found to carry on the work. With the battle for the Bill well won, Adamson and his friends started their second campaign to find the capital. According to the estimates, the canal was to cost £6,311,137, but a contract was signed to carry out the work for £5,750,000. To cover contingencies, the promoters decided to attempt to raise £8,000,000 in shares of £10 by a private appeal. The result shocked them, for they could find no more than £750,000. MANCHESTER SHIP CANAL is the waterway by which vessels of up to 15,000 tons gross can reach the inland city of Manchester from the estuary of the River Mersey. The entrance to the canal is at Eastham, on the Cheshire bank of the Mersey. An embankment was built from this point to Runcorn to retain the waters in the canal. Beyond Runcorn the canal was built mainly by new excavation but partly by using the beds of the Mersey and Irwell. The canal has a total length of thirty-five and a half miles from Eastham Locks to the Mode Wheel Locks, which mark the entrance to Manchester Docks. 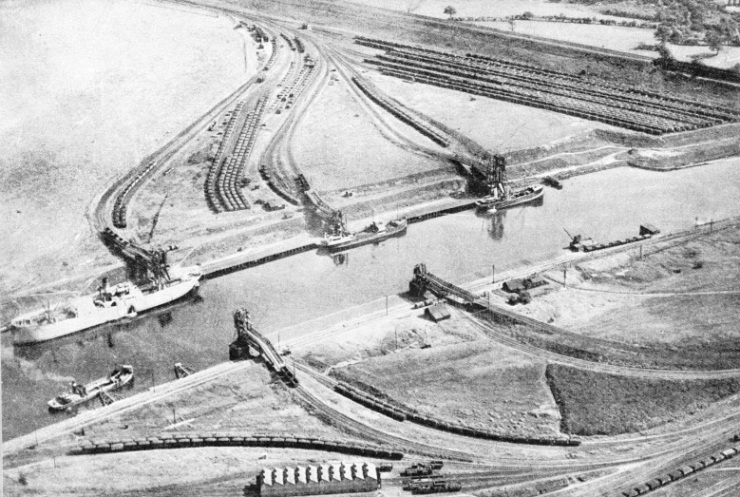 Three intermediate series of locks, at Latchford, Irlam and Barton, raise ships during the transit of the canal. Now that Lancashire had refused to back the ship canal, the promoters turned to London for financial help. The house of Rothschild was approached, and agreed to help. Even the powerful Rothschilds, however, who were wont to deal in millions, failed to induce the public to subscribe the money to build Manchester’s canal. In February 1887 Adamson resigned from the chairmanship of the Ship Canal Company, and Lord Egerton of Tatton, who was connected with the Bridgewater Canal, took his place. The promoters were faced with disaster. Unless they could obtain offers for £3,000,000 in shares and show the receipt of £600,000 in cash before August 6, 1887, all the powers conferred upon them by the Act of Parliament would be brought to an end. Months went by, plans were made, but right up till July 14 the money was still to be found. On July 15 the promoters issued the final prospectus, on which everything depended, and this time the money was subscribed. Their plan was nearly crushed when they were left with only three days to find £1,710,000 to buy the Bridgewater Canal. Blank refusals met them everywhere, but at the last moment Glyn, Mills and Company, of London, advanced the money and saved the Ship Canal scheme. A contract was signed for £5,750,000, for which sum Thomas A. Walker undertook the work of building the canal. The task bristled with engineering difficulties. Thomas Walker, however, had become inured to trouble in building the Severn Tunnel for the Great Western Railway. NEARLY FORTY MILES FROM THE SEA, the Manchester City Docks system covers an area of over 400 acres, including 120 acres of water. The quays have a total length of over five and a half miles. At these quays are discharged from ocean-going vessels all kinds of imports. Directly the contract had been signed Walker began to concentrate the biggest collection of excavating gear ever seen in England. At the same time he was engaged on building the Barry Docks in Wales and the great Government docks in Buenos Aires. On November 11, 1887, Lord Egerton cut the first sod, which Leader Williams, the engineer, put into a barrow and tipped, before the contractor gave the signal for his men to begin work. Walker, however, did not live to see his work completed. He died in 1889 and after that the Ship Canal Company itself undertook the work. The canal planned by Leader Williams was thirty-five and a half miles long. It began at Eastham, on the Cheshire bank of the Mersey estuary, and followed the course of the river for some miles, with strong embankments to separate it from the river. Borings had proved that certain lengths of the canal would have to be cut through sandstone, but fortunately this was generally soft enough for the excavators to scoop up in the normal way. Here and there explosives had to be used to blast a channel through the harder rock, but in the top layers the steam navvies were capable of the task. The most popular type of excavator was the Ruston and Proctor steam navvy. Scooping up loads of sandstone and soil, these machines dropped them into trucks that were hauled away to the dumping grounds. Eventually there were fifty-eight of these steam navvies cutting the great trench that was destined to turn Manchester into a port, with about twenty-two other grabs and dredges, German and French bucket dredges among them. Hundreds of portable and fixed steam engines were used, 228 miles of tracks were laid to enable the 173 locomotives to haul over 6,000 trucks in which the excavated material was transported. PORT FACILITIES AT MANCHESTER include nearly 300 cranes of almost every type, steam, hydraulic and electric. Hundreds of miles of railway tracks and canals serve the inland port and link it with other parts of Great Britain. Up to 16,000 men were engaged and in a few weeks there were notice boards set up along the country roads: “This way to the canal”. When the excavators were cutting their way through the county of Cheshire to Manchester, the sight was amazing. The route was divided into eight sections, each of which had its contractor’s representative and an engineer appointed by the canal company. Thousands of men were to be seen toiling away in the gigantic cuttings that were later to be linked together; at night the gangs worked by the light of oil lamps. Locomotives pulled trains of trucks loaded with spoil along the four or five tracks laid in the cuttings. Gangs of bricklayers, concrete mixers and masons plied their trade. Men laid new lengths of line as the steam navvies ate their way forward. Labourers wheeled barrows full of soil up steeply-inclined planks to the top of the cutting, being helped by horses which hauled on a rope. To provide accommodation for his men, the contractor was obliged to build several townships of wooden houses, in which the navvies lived with their wives and children. A school was built to educate the children, and three hospitals were put up at various places, with proper medical and nursing staff for the treatment of accidents or illness. Each section had its own doctor. Reading rooms were built and missionaries appointed. As numbers of men on the Eastham section lodged in Birkenhead and Liverpool, the contractor acquired a steamer and issued to the men twelve tickets for 9d., returning all the fares as a bonus at the end of eight weeks if the men attended work regularly. When the men reached the cuttings in the morning, there were trains to carry them along to their work. To save the time of the men in getting into and out of the cuttings, the contractor had broad ladderways built so that the men could move up them five and six abreast. Everything was most carefully organized. The cutting of the canal was a long succession of difficulties and troubles, not only to the contractors and engineers but also to the promoters, who were continually having new problems thrust upon them by the local, railway and other authorities. There were several main roads over the route of the canal, a fact which entailed the building of swing bridges. Five railway lines crossed the route, sometimes two or three times in a short distance. These lines belonged to the Great Western Railway, the Cheshire Lines and the London and North Western Railway, whose main line from London to Scotland was affected. The railway companies asked £533,000 as compensation from the Ship Canal Company, and they were awarded just over £100,000 by the arbitrator. 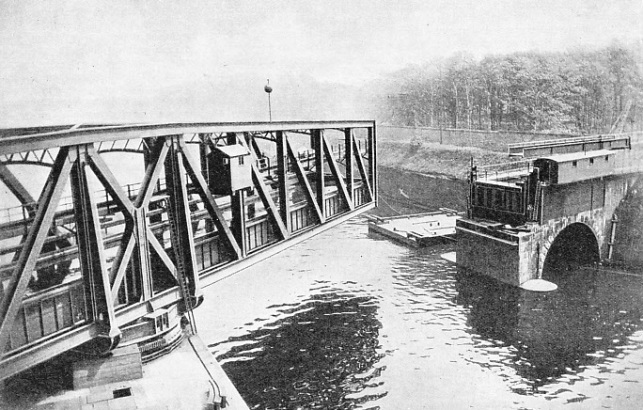 The canal builders had not only to alter the routes of the railway lines so that they should not cross and recross the canal, but they had also to build big embankments or viaducts to raise the level of the lines to carry them across the canal high enough to give clearance to the biggest ships passing below. To raise the railway tracks to the height of the viaducts it was necessary to begin the inclines about a mile and a quarter away from the canal, which was in every instance crossed at an angle. THE WIDTH OF THE SHIP CANAL for the greater part of its length is 120 feet at the bottom, although for 1,200 yards above Warburton Bridge it is only 90 feet and at certain places is increased to about 175 feet. The depth excavated is 30 feet between Eastham Locks and Stanlow Oil Docks and 28 feet for the remainder of the length of the canal. Two of the railways were carried over the canal side by side on a viaduct at Acton Grange, and generally the building of the new tracks and bridges for the railways occupied four years, from 1889 to 1893. The building went on while the navvies were cutting the soil away to form the bed of the canal. 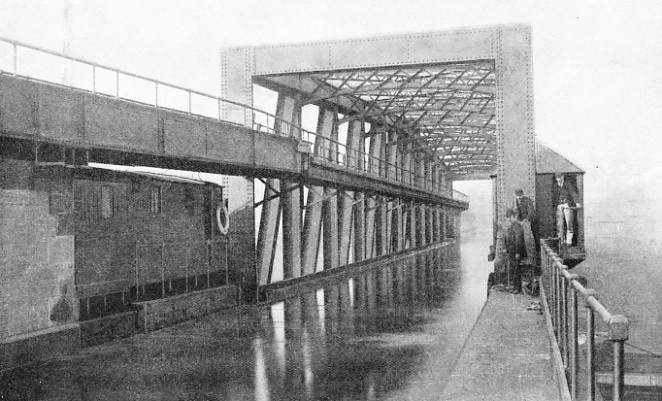 The bridge carrying the Cheshire Lines at Irlam caused some alarm after the canal had been completed; for the heads of the piers began to lean until they were 7½-in out of the perpendicular. It was found that the bed of clay, 21 feet deep, on which the piers were built was covering an underground stream which caused movement in the clay when the canal was weighted by allowing the water to flow into it. The engineers solved the problem by building steel girders to carry the track across in place of the brick arches. For the Warburton cantilever bridge the middle girders were built on barges and floated into position. Cables were then placed under the girders, which were hauled up by crews of fifty men working three winches on either side of the gap. They started raising the girders at 11 o’clock in the morning and continued until 5 o’clock in the afternoon, when the girders were properly housed without one hitch having occurred. In addition to the railways crossing the route, there were the rivers and small streams to be dealt with. The navigation and control of the waters of the River Weaver were assured by building Weston Marsh Lock. It was essential to allow the River Gowy to continue to flow into the Mersey, but the canal stood right across the path. The River Gowy and another stream were directed into two great siphons - iron pipes, 12 feet in diameter - which were carried down under the bed of the canal and up on the other side to empty into the Mersey. Liverpool’s fresh-water supply from Lake Vyrnwy in Wales also had to be tunnelled under the canal. Because of the open nature of the ground, the compressed air which enabled the tunnelling to be carried out escaped through the subsoil, and there was great difficulty in completing the work. Once when it was almost finished a flood demolished the tunnel and the contractor had to begin again. formed more piles were driven; these were tied to the jetty with iron bars. Then a railway track was laid and the trains passed to and fro, tipping their loads of soil to form the embankment. The top of the embankment was 30 feet wide, so massive that the shooting of a thousand loads of ballast a day did not seem to make much appreciable difference. A gap was left in this embankment so as not to interfere with the traffic at Ellesmere Port, and the most elaborate preparations were made for closing the gap at low tide one week-end when the first section of the canal was ready. Huge quantities of material were collected to tip into the breach; hundreds of men were on the spot to help. Working at full pressure, they filled the gap above high-water mark. To their chagrin the rising tide swept away all their work, although they fought hard to prevent any breach. BALES OF INDIAN COTTON being discharged at Manchester Docks. 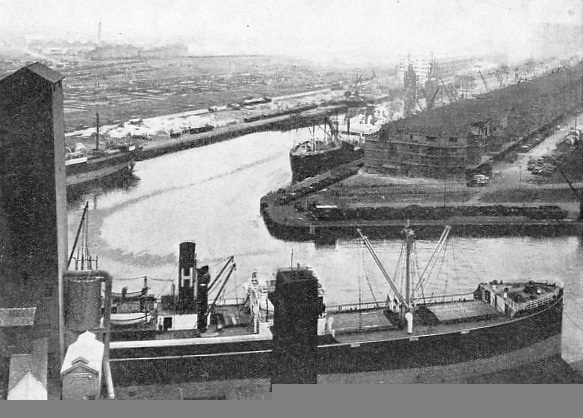 To facilitate the shipment of cotton for the Lancashire cotton mills was one of the aims of the Manchester Ship Canal scheme. Cotton is to-day one of the chief commodities handled at Manchester. Greater efforts were made at the next tide. Hundreds of men sought the biggest stones and rocks they could find, trucks full of soil that accidentally slipped into the gap were left there to help stem the waters, but again the tide rose and swept through its old channel. For the third time the builders strove to keep back the waters of the Mersey, and this time they triumphed. Disastrous floods swept the works from time to time. The first big flood came in 1888, when the cuttings from Warburton were filled and considerable damage was done to the embankments. Again in January 1890 the gales, which wrecked ships all round the coast worked to a climax on January 25 and 26. The downpour brought the waters rushing down from the moors to turn the River Irwell into a torrent, and the gale piled up the waters of the Mersey until nothing could stand against them. The flood waters swept into the cuttings, overturning trucks and destroying the work of months. At Thelwall, where the course of the Mersey was being changed, the river was diverted into an artificial channel, the canal works being protected by a big dam. One Sunday night the watchman here heard startling noises, and found that the dam had been carried away. The waters poured into the 30-feet canal cutting. Across the gap, just above the level of the boiling waters, the railway track was slung askew. At Stretford the whole country was turned into a vast lake by the overflow of the Mersey and Irwell. The embankments were breached at Flixton, Grlazebrook and elsewhere. Miles of the railway track were covered by 6 feet of water. When the water had subsided the works were a distressing sight, with the cuttings strewn with wreckage, overturned plant and great masses of debris washed out of the embankments. In November 1890 the floods wrought more damage, and it was necessary to pump out twenty-three miles of the canal workings. In December 1891 the floods again tried to sweep away the handiwork of man. Sometimes the floods swept into the cuttings in great waves 10 feet high. One or. two men were overtaken by them and drowned. One watchman, seeking to escape by scrambling up the side of the cutting, was saved by a companion above who hauled him out only just in time. When Little Bolton Dam gave way some 65,000,000 gallons of water overwhelmed the cutting in twenty minutes. In some instances the water that swept into the workings in a few minutes took two and three weeks to pump out. These catastrophes added greatly to the expense of the undertaking. Sometimes the floods caused landslides of thousands of tons from the sides of the cuttings, all of which had to be cleared. At other times the floods threw thousands of men out of work because they were unable to proceed until the cuttings had been pumped out. Partly built bridges were destroyed, dredgers buried and overturned, trucks smashed. The toll of damage was huge. By this time it was apparent that to finish the canal would need large additional sums amounting to several millions. Many people doubted if it would ever be completed, although the rate at which the canal was being cut surpassed that of any other undertaking of its kind. At last the City of Manchester stepped into the breach and virtually made itself responsible for the completion of the canal by advancing the necessary money - about £6,000,000 in all. To-day the authorized capital of the company amounts to £21,573,230, and the City of Manchester is part owner of the canal, with eleven seats on the Board as against ten seats held by other shareholders. BARTON AQUEDUCT carries the Bridgewater Canal across the Manchester Ship Canal. The aqueduct is a unique structure and acts as a swing bridge. Situated nearly 32 miles from Eastham Locks, this structure is 235 feet long, 25 feet wide and 33 feet high. A trough, which contains 6 feet of water, forms a continuous section of the barge canal when the bridge that carries it over the Ship Canal is closed. In February 1892 the Mersey gave further trouble. During a gale the waves dealt such shattering blows at the wall of Bridgewater Lock, which was 21 feet thick, that 200 feet of wall were shifted bodily into the lock and smashed into a dozen lengths. The only way that the contractors could deal with this ponderous mass of concrete was to blow it to pieces with explosives and carry it away in bits. The task took weeks. When the canal was finished it was stated that floods and gales had delayed the completion of the work by a year or two and had cost between £2,000,000 and £3,000,000. Despite the engineering and financial difficulties, the first section to Ellesmere Port, about four miles in length, was opened on July 16, 1891. Two years later, on June 9, 1893, the canal was thrown open as far as Runcorn, some thirteen miles from Eastham Docks. The men were toiling night and day to complete Mode Wheel Locks and put the finishing touches to embankments along the rest of the canal, to which water was admitted on November 25, 1893. The canal was traversed from end to end by officials on December 7, 1893, and thrown open for traffic on January 1, 1894, when seventy-one vessels made their way to Manchester. Queen Victoria, on May 21, 1894, steamed along the canal in the Admiralty yacht Enchantress and officially opened the waterway by pressing a button which operated the locks at Mode Wheel. So, at a cost of about £15,000,000 the inland city was turned into a port with a direct way to the sea, wide enough and deep enough to take ships up to 15,000 tons gross. The width of the canal at the bottom over the greater part of the length is 120 feet, the width in the upper lengths being increased where necessary. One stretch of 1,200 yards from Warburton Bridge is only 90 feet wide at the bottom, but where the canal bends at Runcorn it has a bottom width of 175 feet. The excavated depth for the first five miles is 30 feet, with 28 feet for the rest of the way. The fixed bridges give ships a headroom of 73 ft 6-in. Ships with masts and funnels taller than this can have their funnel tops and topmasts removed by the sheer-legs at Eastham and replaced on the return journey. Up to Latchford, a distance of twenty-one miles, the canal is virtually tidal. When the level of the Mersey drops to the level of the canal, the gates at Eastham are closed to maintain the canal level. Ships are raised 14 ft 6-in at Latchford, where the two locks are 600 feet long by 65 feet wide and 350 feet long by 45 feet wide. At Irlam the rise is 16 feet, at Barton it is 15 feet and at Mode Wheel it is 13 feet. All these locks have the same dimensions as those at Latchford, except that the entrance lock at Eastham is 80 feet wide. Other locks give access to the Mersey and to the smaller canals serving the area. The upper part of the canal to Manchester was formed by straightening and dredging out the beds of the Rivers Mersey and Irwell. In the section from Warburton to Barton the Mersey and Irwell wound their sinuous courses across the line of the canal no fewer than fifteen times. This entailed the building of thirty dams and the filling of those parts of the river beds that were not of use. In cutting through the tough ground and soft sandstone the steam navvies averaged about 700 cubic yards a day, but in lighter soil their output rose to 1,000 or 1,100 cubic yards a day. There was keen competition among the men working the steam navvies and dredgers. One day the German excavator, which had a crew of seventeen men, lifted over 3,000 cubic yards of material, which was filled into 750 trucks in 10 hours. Another day a man on a steam navvy in the Latchford section filled 640 wagons with 2,900 tons of soil in the day. WATERTIGHT GATES close the trough of Barton Aqueduct and the ends of the Bridgewater Canal when the aqueduct is swung open to allow a vessel to pass along the Manchester Ship Canal. The joints of the gates are U-shaped in cross-section and are faced with rubber. The weight of the water presses out the sides of the joints against the walls and makes the gates watertight. The machines dug out millions of cubic yards of rock and earth. Much of it went to make the embankments that cut off the lower part of the canal from the Mersey. Much more of it went to fill in the unwanted parts of the rivers in the upper section. Large quantities were shot on the low-lying lands adjoining the canal to raise the level, the canal builders topping this made-up land with eighteen inches of good soil so that crops could afterwards be raised on it. In spite of the many uses to which the excavated material was put in building embankments and levelling up land, a great dump grew at the lower end of the canal and attained such dimensions that it is known to-day as Mount Manisty. Besides carrying rivers under the canal and railways above it, the engineers were confronted with the problem of dealing with the Bridgewater Canal, which crossed the line of the Manchester Ship Canal at right angles just above Barton Locks. Brindley had carried the Bridgewater Canal over the Irwell by an aqueduct on brick piers, and Leader Williams solved a difficult problem by arranging the canal in the aqueduct as a great trough that would swing on a central pivot to allow the big ships to pass. The aqueduct designed by Leader Williams is 235 feet long, 25 feet wide and 33 feet high. The trough, which contains 6 feet of water, is 19 feet wide and 7 feet deep. It was difficult to design watertight doors to prevent the water from flowing out of the ends of the canal and the trough. The real difficulty, however, was not to keep the water inside the trough and the canal when the trough was swung open, but to prevent the water from leaking at the joints when the aqueduct was closed. This problem was solved by fitting at either end of the trough a wedge, shaped in cross section in the form of the letter U. These wedges, which weighed 12 tons each, were faced with rubber. Before the watertight doors on the ends of the canal and the ends of the trough are opened to allow traffic to be resumed, they are pushed into the intervening space by hydraulic rams. The pressure of the water inside the U presses out the sides against the metal walls so that the joint is self-sealing. This swinging aqueduct weighs 1,450 tons, including 800 tons of water in the trough. The central pier revolves on sixty-four big iron rollers, arranged in a circle with the axis of each roller converging on the central point. Before the aqueduct is turned, a central hydraulic press is brought into play to lift and take up about 900 tons of the weight, leaving the rollers to carry the other 550 tons, whereupon the other hydraulic machinery is set in motion to swing the aqueduct. Seven other swing bridges carrying roads are operated in a similar way. Manchester has cause to thank the man who fought to build the canal. 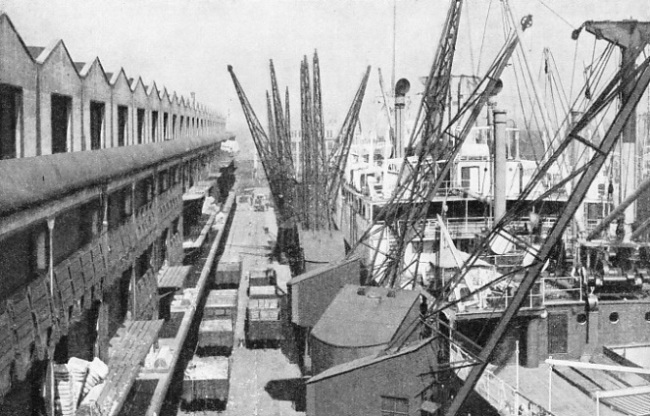 The city has become a thriving seaport, with great docks and warehouses, served by miles of canal and railway lines, and by hundreds of electric and other cranes for handling the merchandise. Its two huge granaries, each of which holds 40,000 tons of grain, are as up-to-date as any in the world. Moving belts pass from the quayside into the granaries, and the grain can be sucked out of ships, weighed automatically, and stored away in the bins at the rate of 900 tons an hour. 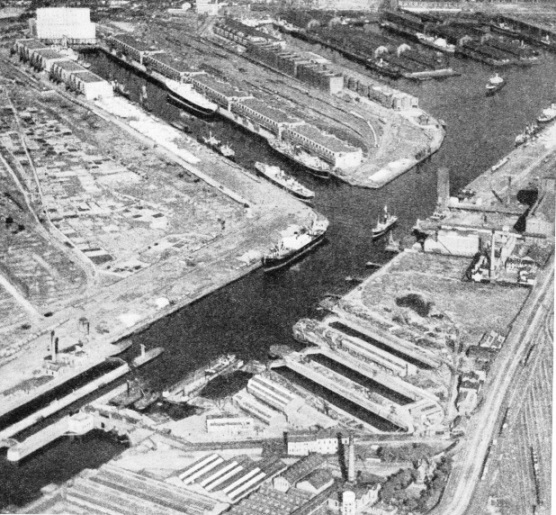 I mmense oil stores, dry docks and factories of every kind have sprung up by the sides of the canal, which since the year 1915 has paid its way and has earned a little for those who backed it so staunchly. In 1926 the canal earned £1,592,219. The slump brought a drop in the receipts, but in 1936 the canal revenue was £1,377,723. Raw cotton, in 1935 touching £15,000,000 in value, takes first place in the imports, with oil next, and manufactured cotton comes first in the exports. Manchester to-day trades direct by sea with all parts of the world. 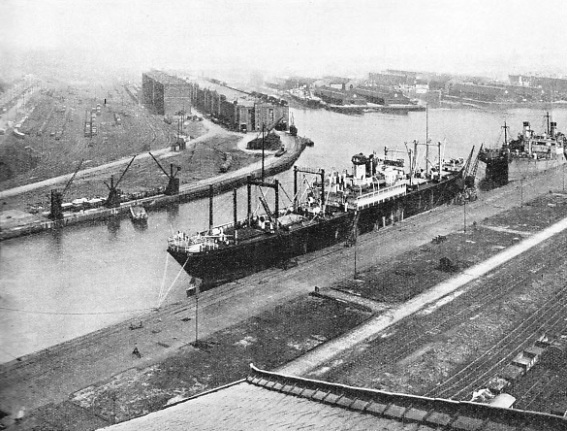 In the canal may be seen a ship coming in from New Orleans loaded with cotton, a whaling factory ship such as the Roald Amundsen, carrying 2,500 tons of whale oil from the Antarctic, or the Manchester Citizen from Montreal with a cargo of Canadian grain in her holds. MODE WHEEL LOCKS form the entrance to Manchester Docks from the Ship Canal. The locks are at the bottom left-hand corner of the picture. In the background is one of the two grain elevators, each of which has a storage capacity of 40,000 tons. 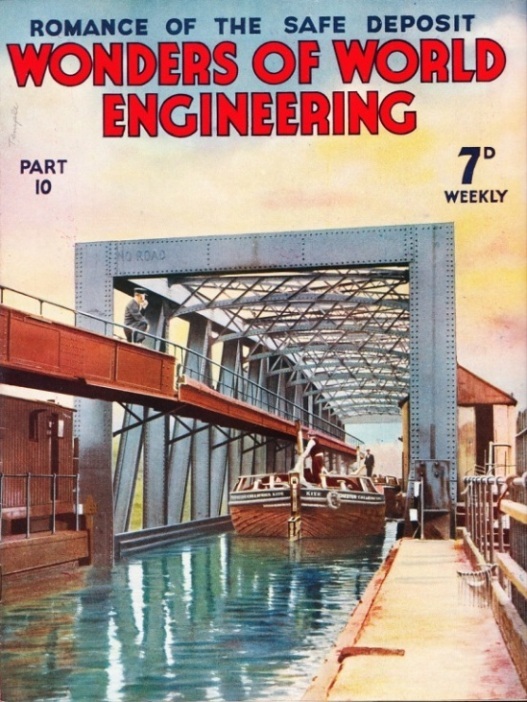 The cover to part 10 shows the unique Barton Aqueduct, which carries the Bridgewater Canal across the Manchester Ship Canal on a swing bridge. How this remarkable arrangement works is described in the chapter on the Manchester Ship Canal. You can read more on “Canals Across Sweden”, “Germany’s Overland Canal” and “Triumphs of Canal Building” on this website. You can read more on “The Manchester Ship Canal”, “Britain's Canal System” and “The Caledonian Canal” in Shipping Wonders of the World.